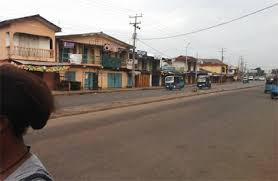 A female police officer and two members of her family in Osogbo, the Osun State capital, died yesterday, following a dinner they had the previous night. The police officer, identified as Mary Samuel, living in a rented apartment at Oloosaoko Compound, Oja-Oba area of the town, was said to have died from food poisoning. Investigation showed that a baby’s continued cries from the apartment attracted neighbours, who out of curiosity discovered the bodies on the floor. The cause of their death could not be ascertained last night. A resident, who preferred anonymity, said they woke up in the middle of the night and heard the persistent cries of a baby from the apartment. According to her, the baby and another woman in the apartment were the survivors. She said: “When the cries of the baby became persistent, I tried to investigate what was going on and on getting to the apartment, I knocked several times without an answer. Then I peeped through the window and saw the woman on a chair. “I raised the alarm and with the help of other people, we tried to force open the door and found Mary on the chair almost n*ked with a torchlight in her hand. The bodies have been deposited at the mortuary of Ladoke Akintola University of Technology Teaching Hospital, (LAUTECH), Osogbo. Police Commissioner, Fimihan Adeoye had earlier visited the scene.